If you've ever looked at the celebrities that makeup artist, Mario Dedivanovic has created beauty looks for, like his star client, Kim Kardashian and wondered - "how can I look like that? ", here's how. Mario Dedivanovic has teamed up with Anastasia Soare, of Anastasia Beverly Hills beauty to create a 12 eye shadow palette of creamy, glitter free, completely wearable and sultry shades called Anastasia Beverly Hills Master Palette By Mario All of the shades are named after places and people meaningful to Mario, like "NYC", "Kim" and "Lula" (his mother - cute!). There are no crazy, bright colors, just pretty, flattering shades like wheat gold, warm tan, brown suede, champagne beige, rose gold, bronze, deep blue and that very unique khaki green "Bronx" - which is amazing on brown eyes, in particular. 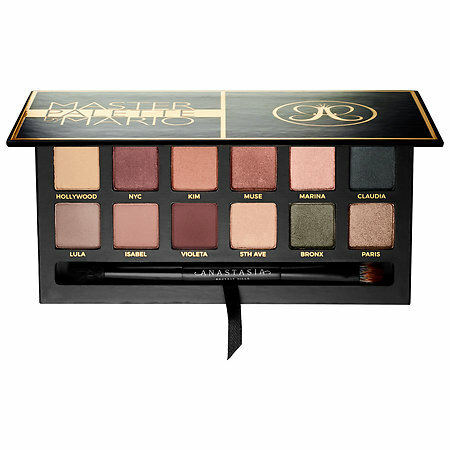 Anastasia Beverly Hills Master Palette By Mario has colors that will work on all skin tones and for literally every occasion and type of beauty look - from ultra glam to paired down natural. All of the shades are made to work with one another, as well as be layered and worn wet or dry. Anastasia Beverly Hills Master Palette By Mario. Some standouts for me that I kept reaching for were Violeta, Muse, Bronx, Claudia and NYC. Kim and Paris were beautiful for highlighting and blending with the deeper shades. All of the shades were long wearing with or without primer and the finish was silky and satin, without glitter or extreme shimmer, making them perfect for day into night beauty looks.